Hi and happy Tuesday. We had some snow the past couple of days, but now it is going to get up to 40 something today and rain so that will take care of the snow. This has been a weird Winter as far as weather. Today's card is for the Challenge at Totally Tilda #39 Pink and Red Valentines. Here comes Tilda with a Rose and a Valentine! Wow, what a lovely card! 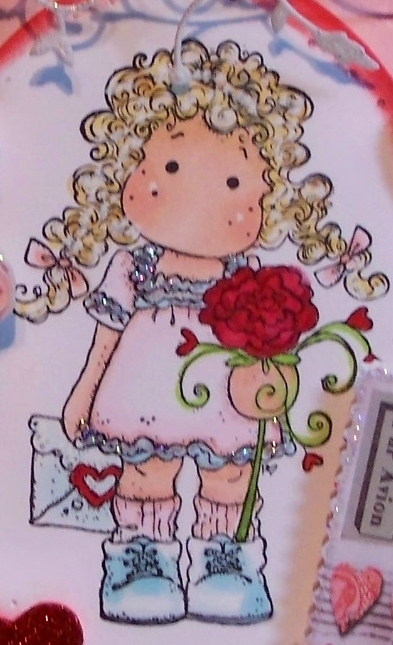 Beautiful card, love how you did the girl's hair and that gorgeous thingy at the top of the card, just a totally wonderful card! 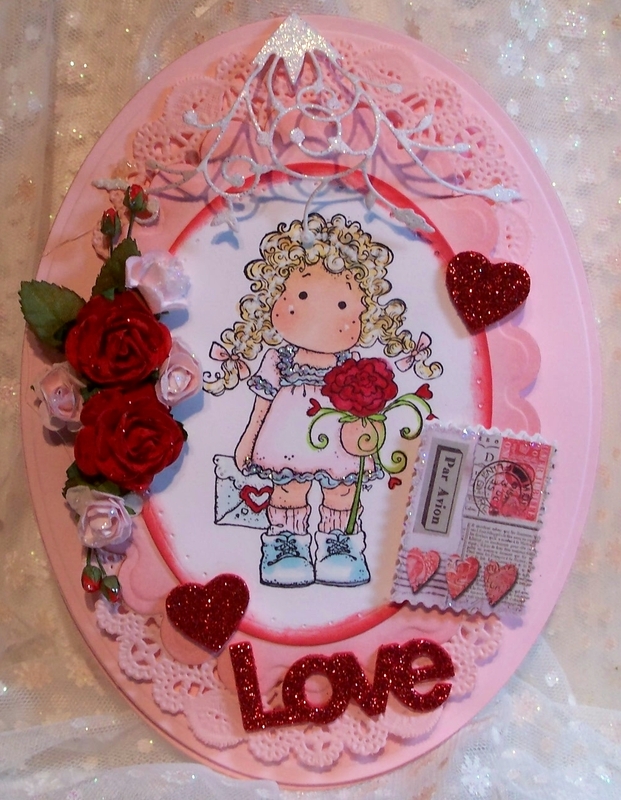 o this is beautiful sue, love the oval shape it's something different. gorgeous image and perfectly coloured and embellished as always. Just beautiful Sue, beautifully colours and attention to detail. Thanks so much for joining us our Hearts theme at Allsorts this week, good luck and hope to see you again. Your card would also fit the theme at our sister challenge Penny Black and More - closes Midnight tonight. Sue, just fabulous. Your coloring is outstanding, as usual for you. Your embellishments are all special, but I think my favorite is that MB die. I just bought a few but I think I'm going to have to add to my little collection. There you ( and your beautiful cards) go, again, making me spend more money. LOL I would spend all that I have to make such gorgeous creations as you produce. I just adore visiting your blog everyday to see what I can learn. Have a great day, although it sounds like it will be mushy there. It was mushy here last week and tomorrow it is going into the high 50s. This winter makes no sense, but I'll take it. Wow Sue this is so sweet and lovely card. The shape of the card really lifts the whole creation! Delighted you joined the Totally Tilda challenge this week so I got a chance to pop by your blog and admire your work! So very pretty!I love the shape and the pretty details!